When Iraq invaded Kuwait in August 1990, the United Nations Security Council immediately condemned Iraq and imposed severe sanctions on it. Why was the UN response so prompt and so unprecedently firm? The US government-media alliance had a standard answer. First, it told us that Iraq's aggression was a unique crime, and thus merited a uniquely harsh reaction. "America stands where it always has - against aggression, against those who would use force to replace the rule of law" - so we were informed by President Bush, the invader of Panama and the only head of state condemned by the World Court for the "unlawful use of force" (in the Court's condemnation of the US attack against Nicaragua). The media and the educated classes dutifully repeated the lines spelled out for them by their Leader, collapsing in awe at the magnificence of his high principles. Second, these same authorities proclaimed in a litany that the UN was now at last functioning as it was designed to do. They claimed that this was impossible before the end of the Cold War, when the UN was rendered ineffective by Soviet disruption and the shrill anti-Western rhetoric of the Third World. Neither of these claims can withstand even a moment's scrutiny. The US wasn't upholding any high principle in the Gulf, nor was any other state. The reason for the unprecedented response to Saddam Hussein wasn't his brutal aggression - it was because he stepped on the wrong toes. Many people realised this, and a worldwide anti-war movement sprung up. Saddam Hussein is a murderous gangster - exactly as he was before the Gulf War, when he was our friend and favoured trading partner. 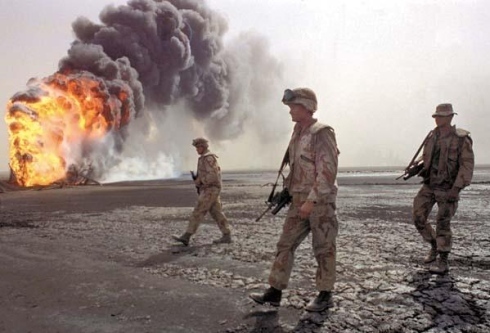 His invasion of Kuwait was certainly an atrocity, but well within the range of many similar crimes conducted by the US and its allies, and nowhere near as terrible as some. For example, Indonesia's invasion and annexation of East Timor reached near-genocidal proportions, thanks to the decisive support of the US and its allies. Perhaps one quarter of the 700,000 population were killed, a slaughter exceeding that of Pol Pot, relative to the population, in the same years. Our ambassador to the UN at the time (and now Senator from New York), Daniel Moynihan, explained his achievement at the UN concerning East Timor: "The United States wished things to turn out as they did, and worked to bring this about. The Department of State desired that the United Nations prove utterly ineffective in whatever measures it undertook. This task was given to me, and I carried it forward with no inconsiderable success." The Australian Foreign Minister justified his country's acquiescence to the invasion and annexation of East Timor (and Australia's participation with Indonesia in robbing Timor's rich oil reserves) by saying simply that "the world is a pretty unfair place, littered with examples of acquisition by force." When Iraq invaded Kuwait, however, his government issued a ringing declaration that "big countries cannot invade small neighbours and get away with it." No heights of cynicism trouble the equanimity of Western moralists. As for the UN finally functioning as it was designed to, the facts are clear - but absolutely barred by the guardians of political correctness who control the means of expression with an iron hand. For many years, the UN has been blocked by the great powers, primarily the United States - not the Soviet Union or the Third World. Since 1970, the United States has vetoed far more Security Council resolutions than any other country (Britain is second, France a distant third and the Soviet Union fourth). Our record in the General Assembly is similar. And the "shrill, anti-Western rhetoric" of the Third World commonly turns out to be a call to observe international law, a pitifully weak barrier against the depredations of the powerful. The UN was able to respond to Iraq's aggression because - for once - the United States allowed it to. The unprecedented severity of the UN sanctions was the result of intense US pressure and threats. The sanctions had an unusually good chance of working, both because of their harshness and because the usual sanctions-busters - the United States, Britain and France - would have abided by them for a change. But even after allowing sanctions, the US immediately moved to close off the diplomatic option by dispatching a huge military force to the Gulf, joined by Britain and backed by the family dictatorships that rule the Gulf's oil states, with only nominal participation by others. A smaller, deterrent force could have been kept in place long enough for the sanctions to have had a significant effect; an army of half a million couldn't. The purpose of the quick military build-up was to ward off the danger that Iraq might be forced out of Kuwait by peaceful means. Why was a diplomatic resolution so unattractive? Within a few weeks after the invasion of Kuwait on August 2, the basic outlines for a possible political settlement were becoming clear. Security Council resolution 660, calling for Iraq's withdrawal from Kuwait, also called for simultaneous negotiations of border issues. By mid-August, the National Security Council considered an Iraqi proposal to withdraw from Kuwait in that context. There appear to have been two issues: first, Iraqi access to the Gulf, which would have entailed a lease or other control over two uninhabited mudflats assigned to Kuwait by Britain in its imperial settlement (which had left Iraq virtually landlocked – see our 1900-2000 timeline of Iraq); second, resolution of a dispute over an oil field that extended two miles into Kuwait over an unsettled border. The last known offer before the bombing, released by US officials on January 2, 1991, called for total Iraqi withdrawal from Kuwait. There were no qualifications about borders, but the offer was made in the context of unspecified agreements on other "linked" issues: weapons of mass destruction in the region and the Israel-Arab conflict. The latter issues include Israel's illegal occupation of southern Lebanon, in violation of Security Council resolution 425 of March 1978, which called for its immediate and unconditional withdrawal from the territory it had invaded. The US response was that there would be no diplomacy. The media suppressed the facts, Newsday aside, while lauding Bush's high principles. The US refused to consider the "linked" issues because it was opposed to diplomacy on all the "linked" issues. This had been made clear months before Iraq's invasion of Kuwait, when the US had rejected Iraq's offer of negotiations over weapons of mass destruction. In the offer, Iraq proposed to destroy all such chemical and biological weapons, if other countries in the region also destroyed their weapons of mass destruction. Saddam Hussein was then Bush's friend and ally, so he received a response, which was instructive. Washington said it welcomed Iraq's proposal to destroy its own weapons, but didn't want this linked to "other issues or weapons systems." There was no mention of the "other weapons systems," and there's a reason for that. Israel not only may have chemical and biological weapons - it's also the only country in the Middle East with nuclear weapons (probably about 200 of them). But "Israeli nuclear weapons" is a phrase that can't be written or uttered by any official US government source. That phrase would raise the question of why all aid to Israel is not illegal, since foreign aid legislation from 1977 bars funds to any country that secretly develops nuclear weapons. Independent of Iraq's invasion, the US had also always blocked any "peace process" in the Middle East that included an international conference and recognition of a Palestinian right of self-determination. For 20 years, the US has been virtually alone in this stance. UN votes indicate the regular annual pattern; once again in December 1990, right in the midst of the Gulf crisis, the call for an international conference was voted 144-2 (US and Israel). This had nothing to do with Iraq and Kuwait. The US also adamantly refused to allow a reversal of Iraq's aggression by the peaceful means prescribed by international law. Instead it preferred to avoid diplomacy and to restrict the conflict to the arena of violence, in which a superpower facing no deterrent is bound to prevail over a Third World adversary. As already discussed, the US regularly carries out or supports aggression, even in cases far more criminal than Iraq's invasion of Kuwait. Only the most dedicated commissar can fail to understand these facts, or the fact that in the rare case when the US happens to oppose some illegal act by a client or ally, it's quite happy with "linkage." Take the South African occupation of Namibia, declared illegal by the World Court and the UN in the l960s. The US pursued "quiet diplomacy" and "constructive engagement" for years, brokering a settlement that gave South Africa ample reward (including Namibia's major port) for its aggression and atrocities, with "linkage" extending to the Caribbean and welcome benefits for international business interests. The Cuban forces that had defended Namibia's neighbour Angola from South African attack were withdrawn. Much as in Nicaragua after the 1987 "peace accords," the US continued to support the terrorist army backed by the US and its allies (South Africa and Zaire) and is preparing the ground for a 1992 Nicaragua-style "democratic election," where people will go to the polls under threat of economic strangulation and terrorist attack if they vote the wrong way. Meanwhile, South Africa was looting and destroying Namibia, and using it as a base for violence against its neighbours. In the Reagan-Bush years (l980-1988) alone, South African violence led to about $60 billion in damage and over a million and a half people killed in the neighbouring countries (excluding Namibia and South Africa). But the commissar class was unable to see these facts, and hailed George Bush's amazing display of principle as he opposed "linkage" - when someone steps on our toes. More generally, opposing "linkage" amounts to little more than rejecting diplomacy, which always involves broader issues. In the case of Kuwait, the US position was particularly flimsy. After Saddam Hussein stepped out of line, the Bush administration insisted that Iraq's capacity for aggression be eliminated (a correct position, in contrast to its earlier support for Saddam's aggression and atrocities) and called for a regional settlement guaranteeing security. Well, that's linkage. The simple fact is that the US feared that diplomacy might "defuse the crisis," and therefore blocked diplomacy "linkage" at every turn during the build-up to the war. By refusing diplomacy, the US achieved its major goals in the Gulf. We were concerned that the incomparable energy resources of the Middle East remain under our control, and that the enormous profits they produce help support the economies of the US and its British client. The US also reinforced its dominant position, and taught the lesson that the world is to be ruled by force. Those goals having been achieved, Washington proceeded to maintain "stability," barring any threat of democratic change in the Gulf tyrannies and lending tacit support to Saddam Hussein as he crushed the popular uprising of the Shi'ites in the South, a few miles from US lines, and then the Kurds in the North [who had already suffered in the Halabja Massacre with the complicity of the US].